We had a super quick flight from LHR to CDG, a total of 45 minutes to be precise. I don't think I have ever been on a plane journey so short, felt as if I had only just sat down to then hear an announcement from the pilot saying we were starting the descent & would be landing in 20 mins! Crazy. After arriving in Paris we had to get the RER B train from the airport to our hotel. Well, we got there eventually after not being able to find the right metro line at first. It's easy once you get used to it but at first it looked like a colourful, numeric maze. We really weren't getting anywhere by looking at the map so I approached a lady who looked as if she knew what she was talking about, (I could see her directing someone else). Much to our relief she spoke English and was so lovely that she went out of her way to take us directly to our hotel by getting on the Metro with us and before we knew it, there we were right on the doorstep of our hotel. As if she hadn't been kind enough already, she wrote down a useful website, her name & number and told us to call her if we needed any help. This reassured me that there are still some genuine and nice people in the world. Such a positive start to our trip! Pierette, what a lady you are! By the time we had unpacked and got ourselves organised it was already 5pm. We agreed that it would be nice to take a trip to see the Eiffel Tower lit up at night. We got off the Metro at Trocadero, which has an incredible view of the city & Eiffel Tower itself. So amazed, we sat for an hour just looking at it. Oh and taking photos - of course. After this, we ended our day by sampling some of the finest food in France... McDonald's ha ha! Much needed sleep - check! We were out of the hotel bright & early to make sure we arrived at the Eiffel Tower for our slot at 11am, thankfully we pre-booked as it was super busy. It's definitely worth being organised if you're thinking of visiting Paris at any point. I knew the Eiffel tower was big, but until I saw it from ground level, I didn't quite realise how big. I know I'm small but woaaaaaah. As everyone knows, the weather is never great in January so we were super lucky that the sun was shining when we went up. You can honestly see for miles and the view is breath-taking. Paris is full of beautifully designed buildings, which makes it such a pretty city. Sadly the summit was shut due to maintenance work so we only managed to get as high as level 2. I think I might have secretly been quite terrified had we gone any higher. After grabbing some snacks to keep our energy levels high, we took the Big Red Bus Tour (Cars Rouges, if you'd prefer it in French) around the city. It was 27 euros but definitely worth the price as it took us to all the main monuments which helped us get our bearings for when we wanted to visit them individually. Originally we had planned a boat trip along the river Seine, but decided we would see much more on an open top bus and we certainly did. We ended the day by having dinner at a local restaurant. Pizza and salad... yum. To say our penultimate day was busy would be an understatement. We started off on The Avenue des Champs-Élysées, retail therapy - my fave. Sadly most of the shops were way out of my price range *sobs*. MAC & Sephora however, what a dream combo. After seeing the craze of macaroons everywhere, I just had to try them and where better than the glamorous Ladurée, a luxury French bakery. Not only do macaroons look nice, they taste it too. Once we had finished shopping, heading in the direction of the Arc de Triomphe, we made the decision to climb to the top, seeing as it is one of the most famous monuments in Paris. (Note: if you're ridiculously unfit like me, you'll only just survive the stairs.) When we eventually reached the top 173772 stairs later (or what felt like it at least!) we stood and watched the city go by from above. Following this, we hopped on the Metro towards the Louvre & stopped in a café called 'The Cooperative'. I went for the unhealthy option and had a crêpe. Pont des Arts is one of the Love-lock bridges in Paris - I love the meaning behind this bridge, such a nice idea to place a lock and throw the key in the water to symbolise everlasting love. Definitely an unforgettable memory for anyone who visits with a loved one. I could have spent hours looking at all the different locks. The bridge just looks so pretty. After the Love Lock bridge we went to see The Louvre, one of the world's largest museums and a historic monument. We never had time to go inside so instead we posed for pictures next to the glass pyramid and had a wander round the courtyard. By this point we were both dying to sit down, so we whizzed back to the hotel, had a rest for an hour or so and then back out we went, straight to the Eiffel Tower. Obviously it was a must to go up it at night as well as during the day. The Paris skyline looks even more impressive lit up. There was no way I was going to leave Paris without seeing the Eiffel Tower sparkle - 9pm on the dot we were there at the ready to capture it at its best. Magical. Certainly the perfect way to spend our last evening, after a successful but exhausting day. Our final day! We attempted more steps up to the Sacré Coeur, a beautiful church, which was so relaxing I could have fallen asleep. The designs on the stained glass windows were unbelievable, something which definitely caught my eye. Sadly, I didn't manage to get a picture as my camera died. What idiot doesn't bring a charger away with them? OH. Following this, we walked through the village of Montmartre, full of lots of lovely little shops. Being the chocaholic I am, I obviously spotted a chocolatier called Georges Larnico. In the centre of the shop there was a mind blowing chocolate statue of the Notre Dame, I still don't believe it was made out of chocolate. One word… HOW? Well that was me baffled for the day. 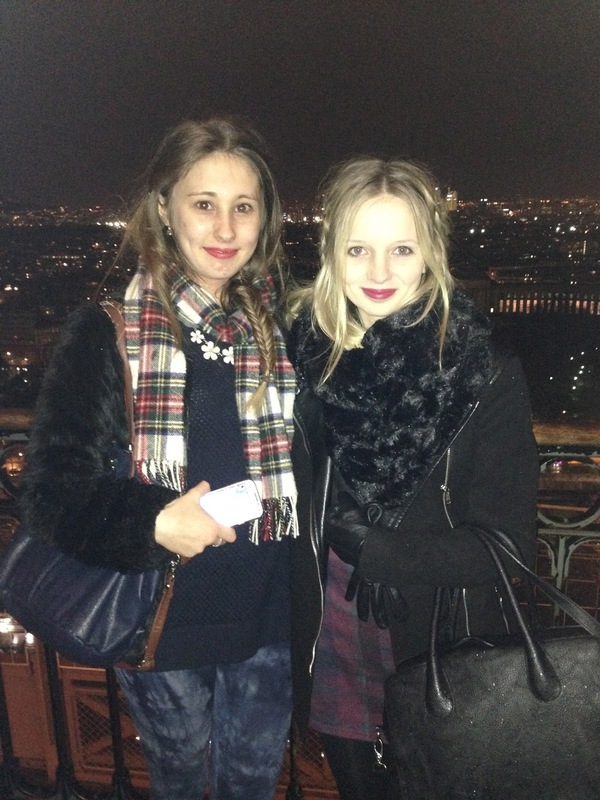 With only a few hours until we had to travel to the airport we decided to get off the Metro at Opéra. First stop, Starbucks, which looked more like a palace rather than a coffee shop- not complaining. Finally we ventured around the shops for a last minute browse. So there you have it. Paris summed up in quite a few words. Gutted I couldn't have stayed for the whole duration of Fashion Week which takes place next week! One day hey? Wow sounds like an amazing trip- well done for getting through so much I felt exhausted just reading the end of day two ha ha.